New World Auto Transport and New World Carrier Services are family owned and operated businesses which value excellence. With over 40 years of experience in all aspects of the automotive industry, we have the ability to provide you with expert knowledge. Owners Steve and Daisy opened and launched New World Carrier Services, LLC in April of 2016 to provide even more specialty concierge services to our clients. 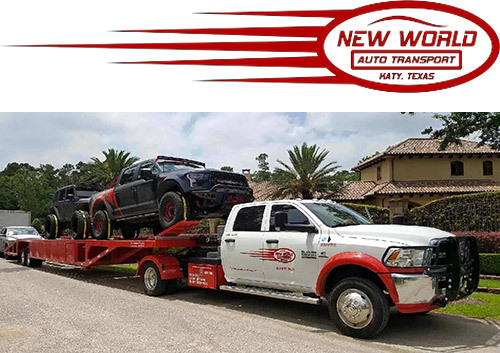 New World Auto Transport and New World Carrier Services includes both open and enclosed transport options to meet every client's needs. Our transport services reach from coast to coast, state to state, in order to meet the fast-paced demands of our clients. For celebrities to auto enthusiasts to car delearships even college students heading to school, we're able to move cars all across the USA and beyond! At New World Auto Transport and New World Carrier Services, LLC, we cover all angles of vehicle transport, even for international clients. As part of our comprehensive auto transport and storage services, we recently were commissioned to pick up two valuable Ford GT40s in Midland, Texas and transport them to a freight forwarder at the port in Galveston, Texas where we shipped them to Le Mans, France for a Ford Tribute. This event was a part of the annual 24 Hours of Le Mans Race, scheduled in the month of June. Our customer was able to drive his cars as part of the celebration on the Le Mans road track and was also awarded one of the first new 2017 Ford GTs. We're always looking for new and improved ways to serve our clients. With the introduction of New World Carrier Services, LLC, we're able to offer even more specialized care and the personal attention that's earned the respect of auto enthusiasts across the country.